Punga Miniatures has been working very hard on their popular (... pupular?) 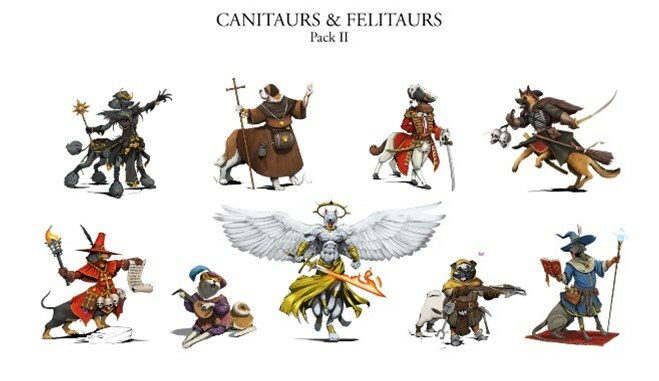 line of Canitaur and Felitaur figures. The first batch sold like hotcakes, with a second one making its way to Kickstarter soon. They wanted to show off a preview page of the campaign so you can get all excited about what's going to be released. All sorts of adventures might await you when you travel amongst the Canitaurs - will you go on a high seas adventure? Hunt in the woods with the greyhound rangers? The Deck of Many: Canitaurs has all these options - and more!